Everything you need to celebrate and mourn the final season. It’s spring. But winter is finally here: the final season of Game of Thrones premieres this weekend. As the way we consume media continues to evolve, George R. R. Martin’s epic saga might be the last show that hordes of viewers watch together, tuning in Sunday night for every dragon, frost zombie, and backstabby twist. As we gear up for the epic conclusion and the extreme sadness that soon, like Ned Stark and Balon Greyjoy, will be no more, we wanted to, well, gear up Game of Thrones lovers. 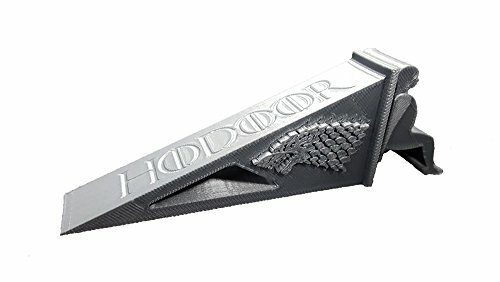 From a Hodor-themed door stop (get it?) 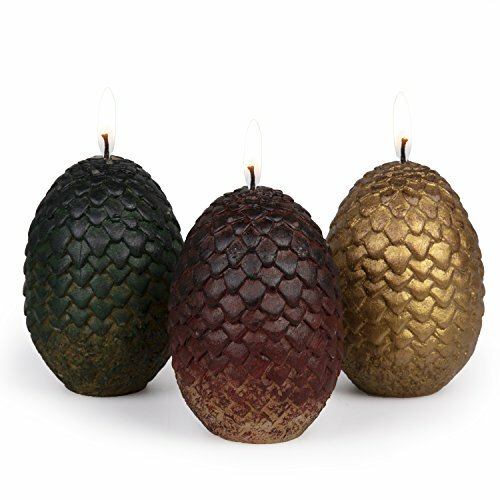 to a sculpted dragon’s egg candle for every mother (or father) of dragons, they’re the idea gifts for any Game of Thrones lovers — or those who want to throw viewing parties worthy of King’s Landing. This 3D-printed doorstop has the authentic GoT font and the direwolf from the Stark sigil. A doorstop only does one thing, so it makes sense to get one that’s an homage to the character whose entire life was changed so he could do that one thing. The official companion cookbook to the series has recipes from across Westeros. 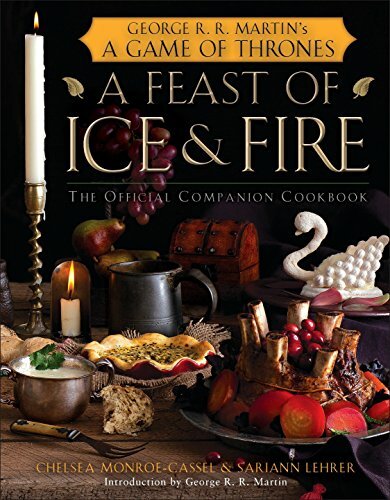 There will be no shortage of weekly viewing parties during the final season, and this cookbook is a great way to prepare themed dishes like stuffed grape leaves from Dorne and lemon cakes from King’s Landing. This pair of GoT-themed gloves is made with a blend of heat-resistant silicone and cotton. 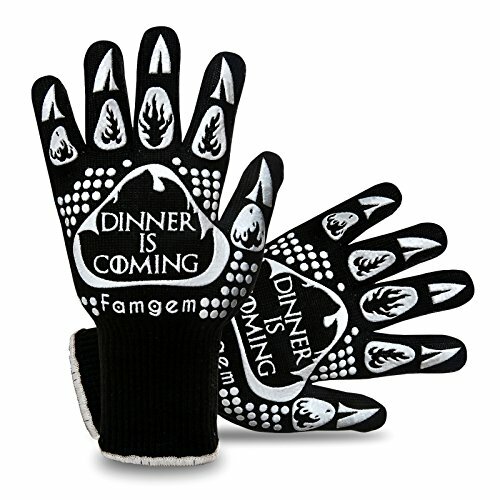 If you’re going to make Thrones-themed meals, you’re going to want to go all the way and use these “Dinner is Coming” gloves. Four pairs of socks, each adorned with one of your favorite characters from the show. Tyrion, Jon Snow, Khaleesi, and Arya come in a limited edition set of socks that are a comfortable blend of cotton, polyester, and Spandex. 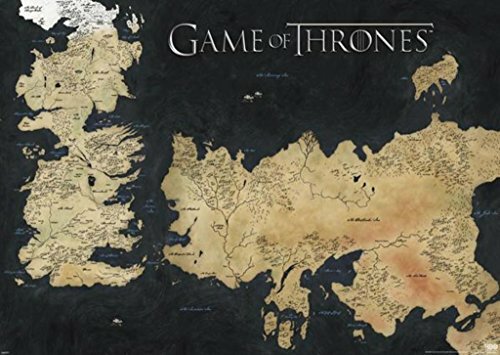 A giant map of Westeros and Essos that you can hang in your living room. Game of Thrones can get confusing, but by hanging this poster in your living you’ll make it easier to understand where the action is taking place, from the Red Waste to Castle Black. This set of three candles makes us remember one of the coolest scenes in the entire series. Don’t walk into a funeral pyre carrying these. Do light them to set the mood for your next screening. 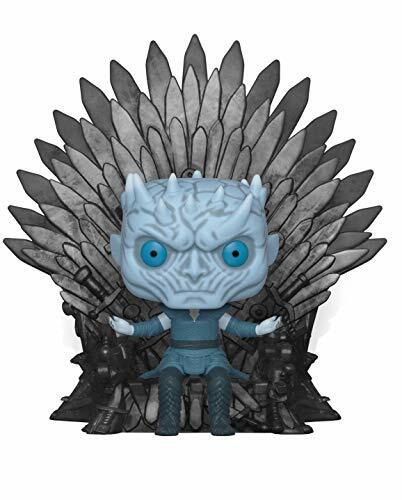 The Night King sits on the throne in this instantly collectible figurine. Funko figurines have become a pop culture mainstay, and this one featuring the night king does not disappoint. Take your pick from nine different Game of Thrones scotches from brands like Johnnie Walker, Lagavulin, and Talisker. Chances are, you’ll need a drink or two to make it through this season. Why not try one (or more) of these special edition scotches? 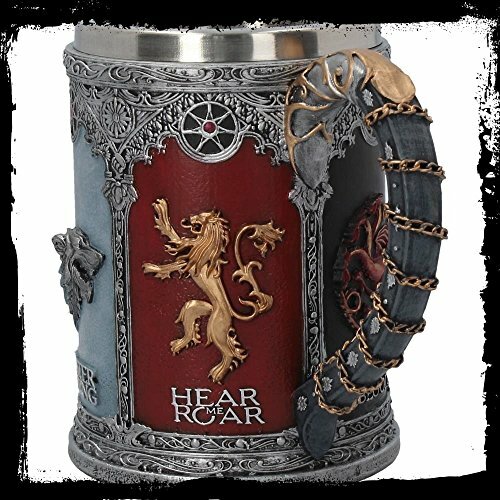 This stainless steel tankard is adorned with sigils from each house in Westeros. You don’t have to be a scotch drinker to celebrate the series. Beer fans can sip their suds from this hand-painted tankard. Display your loyalty with an officially licensed sigil. 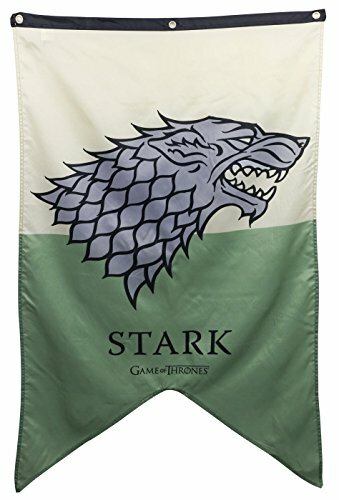 These 30- by 50-inch polyester banners are available for all of the houses featured in the series (and the Night’s Watch).